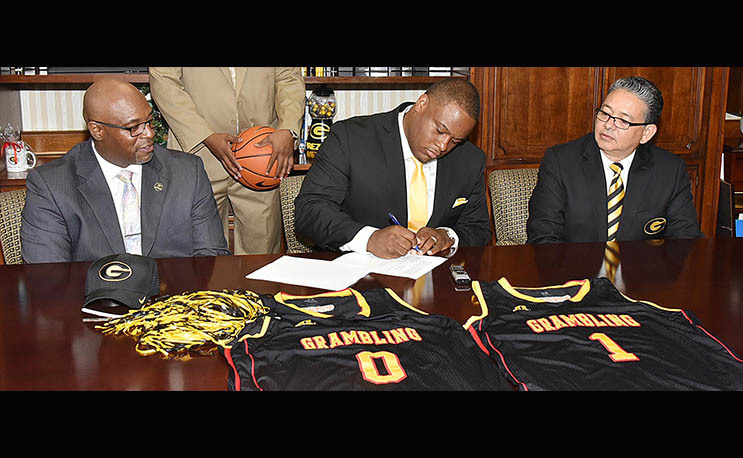 Grambling’s new hoops coach is signed, sealed and delivered. GRAMBLING, La. – Grambling State University Director of Athletics Paul Bryant officially announced the hiring of, and signed, Donte’ Jackson as the next GSU head men’s basketball coach during a Wednesday morning news conference. Jackson officially signed his contract in front of a small crowd of media members, athletics staff and his family in the office of GSU President Rick Gallot. Bryant welcomed Jackson to the department by giving him an official Grambling State pin and baseball cap. Prior to GSU, Jackson spent three seasons as the head men’s basketball coach at Stillman College in Tuscaloosa, Alabama. During his time there, he went 66-21 overall and won the 2016 Southern Intercollegiate Athletic Conference (SIAC) Tournament and earned a berth in the NCAA tournament, where they defeated West Georgia in the first round. At the end of the 2015-16 season, he was named the SIAC Coach of the Year, as well as BOXTOROW National Coach of the Year. In his last year at Stillman, he also served as Stillman’s interim director of athletics, in addition to maintaining his role as head men’s basketball coach. Prior to Stillman, Jackson led the men’s basketball program at Central State University (CSU) in Wilberforce, Ohio, for four seasons. He took over the program in 2010 after serving as an assistant coach at CSU for seven seasons. The Milwaukee, Wisconsin, native graduated from CSU in 2003 with a bachelor’s of science in education, and in 2008, he earned a master’s of science in educational leadership. He was a three-year letter winner on the Marauder basketball team and earned all-conference and all-region honors during the 2001-02 season. He led the Marauders to the NAIA Division I National Tournament and a Sweet Sixteen appearance with a 24-8 record during 1999-2000 season. Jackson capped his stellar career by being selected as the recipient of the John W. Garland President’s Award, presented annually to a student-athlete who embodies the highest standards of leadership, integrity and sportsmanship through academic and athletic achievements.